American sport and, a bit more recently, Football in Britain, is big business. The Premier League has shown that, as in the US, Business and Sport can successfully mix. But both at a global and national level cricket for a long time eschewed being primarily driven by money and measured by commercial success. No more ! If you want to understand where cricket is going then follow the money. The success of the Indian Premier League has been the model for most other cricket playing countries and, as England and Wales Cricket Board (ECB) chairman Colin Graves says today, England's T20 offer is "mediocre" by comparison. We should have the best domestic T20 contest of them all. Played in the summer months on long light days at a time of the year when little cricket is played elsewhere in the world it should be a winner attracting the biggest stars. The commercial potential is enormous. So why not? In one word - the counties. Our county-based domestic system was designed in a different age. Cricket was substantially amateur and cricket administrators totally so. A private member's club, the M.C.C. ran the show. The game only had a two innings (three or four day) format. It made little money and the professionals received little. The "Love of the Game" meme was the dominant one. The number of First Class county teams rose over the years until by the time of Durham's ennoblement in 1992 it reached 18. And when the ECB dreamed up Twenty20 for the 2003 season it was unthinkable then that it would be anything but a county competition with 18 participants. But times have changed ! The reality is not just that an 18 team competition makes no sense for T20 in today's cricket world but that a fully professional 18 club structure is unaffordable as well. It is no coincidence that watching international cricket in England is by far the most expensive in the world. Tickets at the ground reach over £100 a day for the top matches at the most popular venues. And if you want to see international matches on television you'll need a Sky subscription at over £600 per year! All this in part to help keep 18 counties afloat - the money you pay to watch international cricket flows in substantial part to the counties most of which would be bankrupt without it. The need for modernisation in English domestic cricket is clear. 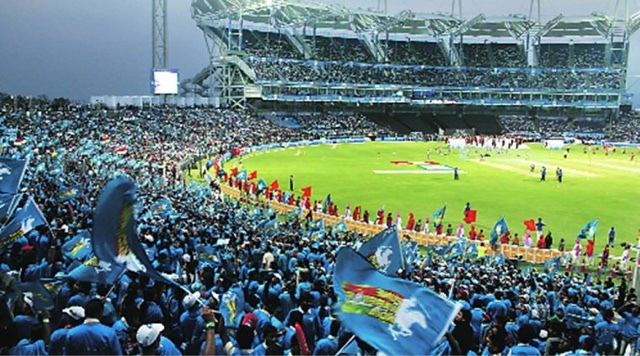 An eight-team City-based T20 competition played in high summer with no other professional cricket being played at the same time is the start point. I would create new franchises on the IPL model but that is not the only option. I would also consider non-traditional venues such as the Olympic Stadium or Wembley along with the obvious candidates - the current international venues such as Edgbaston and The Oval. There is no need for the Franchises to be based on the current counties but in order to get them to agree ( County chairmen control the ECB) that concession might be necessary. The two-innings game is fading. Outside of England and Australia even Test matches are attracting few spectators and declining media interest. Follow the money again. If nobody watches the domestic two-innings game and if Test cricket is struggling against the competition of T20 there will be only one winner. The recent International T20 contest was a big success and the triumph of the West Indies a joy to watch. It was top class sport and there will be no holding it back. Expect it to become an annual event. This is the context in which decisions about cricket in England have to be made. There is great nostalgia about the County system but for T20 it simply doesn't deliver. And for two-innings cricket the cost/benefit analysis is completely negative. To have more professionals playing the four-day game in England than in the rest of the cricket world put together makes little sense! It doesn't even deliver consistent success in Test cricket and few in our Test squads play it at all! The model for County cricket might be to have a much reduced competition with fewer teams at a much reduced annual cost. This could be a pyramid with many of the counties reverting to being predominantly amateur (like the current "Minor" counties) and with an elite group of no more than ten being fully professional clubs. The elite group might use the same venues as the T20 franchisees and, indeed, be the same businesses. Warwickshire might have an elite county team and a T20 franchise - the Birmingham Bears. (They county has already anticipated this in their current branding actually !). Colin Graves is not the first ECB Chairman to find change difficult. His predecessor did not attempt to change the county system but focused, with some success, on the England teams. He was re-elected by the Counties because he looked after them. For Graves that is not an option. He must create a fit-for-purpose commercially-viable T20 competition legally disconnected from the old county system (though with some appropriate links to it). There must be no fudge. Once this is established he can then turn his attention to the two-innings game. But he must not allow cricket's affection for the traditional 18 County-based format of the latter to skew his judgment. As a Yorkshireman he shouldn't worry about the need to "follow the money" !